When we think of combat, graphic images of violent competition come to mind: humans with swords or guns, sheep ramming their heads together, or cats fighting with tooth and claw. Even tortoises, which seem like peaceful creatures, attempt to flip their opponent onto their backs – a potentially lethal sentence. So venomous snakes, perceived to be ruthless, cold-blooded killers, must put on quite a show when they fight. A pair of male western diamond-backed rattlesnakes in combat over an unseen female. Rattlesnake combat is an elaborate wrestling match, where each snakes tries to topple the other. Although rattlesnakes are not immune to their own venom, they rarely bite during combat and there is little rattling. The fight is so peaceful that it is often mistaken for courtship between a male and female (courtship dance). 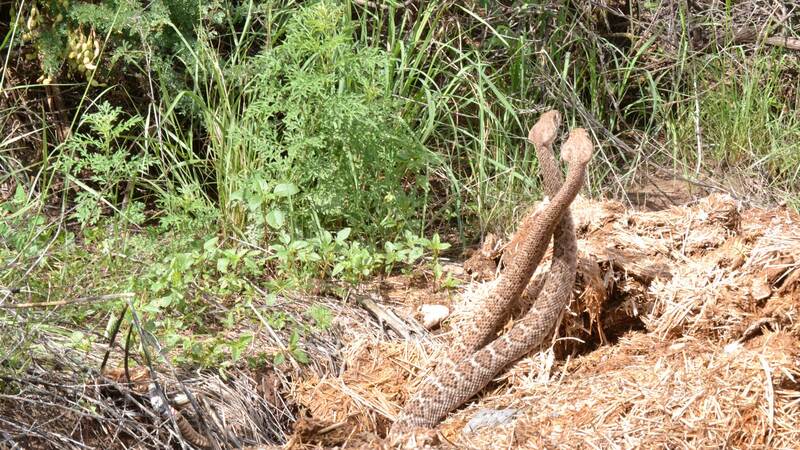 So how do you differentiate between rattlesnake courtship and combat? Rattlesnake rarely elevate their head or body during courtship, while this behavior is characteristic of combat. But the biggest difference is that it takes two to tango, or combat: both males are active participants. Courtship, on the other hand, involves a lot of action by the male (trying to get the female interested in him), usually with little noticeable response from the female. In the following video Jaydin and Marty (another male) engage in combat. As is usually the case, we found Persephone nearby. Rattlesnakes are not territorial: they share dens and nest sites, their home ranges overlap, and outside the breeding season, encounters between even male rattlesnakes don’t usually end in a fight. But males do engage in non-violent combat for females. Combat and courtship in non-venomous snakes is quite different; there is biting and blood may be shed. For a story about gophersnake lovers and fighters, with lots of videos, check out Ménage à trois parts 1 and 2.